Ideal for those situations where you can't decide what magnet size/shape might work for your application. 1/8" cubes - 4 ea. 1/4" cubes - 4 ea. 1/2" cubes - 2 ea. 1/4" spheres - 4 ea. 3/8" spheres - 2 ea. 1/2" spheres - 2 ea. 1/4" dia x 1/16" disk - 4 ea. 1/4" dia x 1/8" disk - 4 ea. 1/2" dia x 1/16" disk - 2 ea. 1/2" dia x 1/8" disk - 2 ea. 1/8" dia x 1/8" rods - 4 ea. 1/8" dia x 3/8" rods - 4 ea. 1/8" dia x 1/2" rods - 4 ea. 1/4" dia x 1/4" rods - 4 ea. 1/4" dia x 1/2" rods - 2 ea. 1/4" dia x 1" rods - 2 ea. 1/2" dia x 1/8" ring - 4 ea. 1/4" dia x 1/4" tube - 3 ea. 1/2" x 1/2" x 1/8" plates - 2 ea. 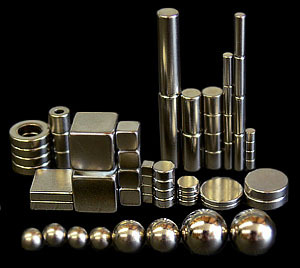 Note: We occasionally may have to substitute some magnet shape/sizes for other magnets of similar or greater value depending on current availability.